Property 16: Enjoy a round of golf while staying in our cozy country cabin. Property 17: Cute SARADISE COTTAGE......Saratoga, Central Coast N.S.W. Property 21: Studio 44 B&B Balmain. A cottage in a garden. Property 43: Central Albury location with tennis court. Family and Pet friendly. 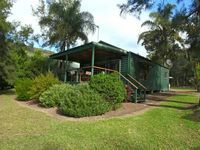 Property 46: CONYNGHAM COTTAGE - located at Gladstone SA. Southern Flinders Ranges.